Animalintex is a wound dressing for horses and dogs with anti-inflammatory and disinfectant action. Animalintex is a wound dressing for horses with anti-inflammatory and disinfectant action. Animalintex is used for many purposes, especially for horses and dogs suffering with injuries, and can be used wet or dry, as well as hot or cold. 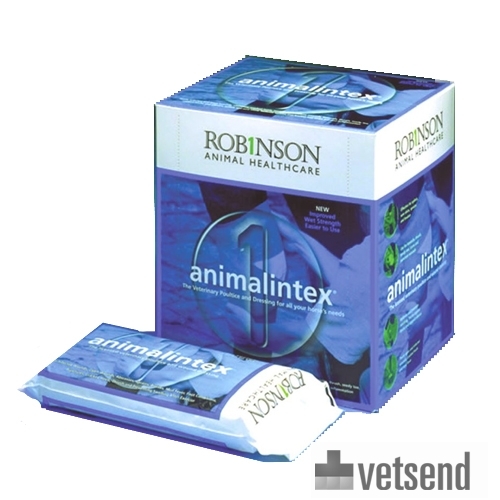 Animalintex is widely used for covering infected wounds, and as a wet bandage for tendon and joint disorders. Animalintex has a strong cleansing and astringent effect thanks to the boric acid and bassorin. Simply keep it in place with an adhesive or adhesive bandage. Animalintex is ± 20 cm wide and 40 cm long. You cut it off as needed, the rest you can keep in a clean place. Animalintex is the most versatile dressing ever, you can use it hot or cold, depending on what you want to use it for. Cut a piece of the Animalintex so it generously covers the area, put the rest back in the bag for later use. Put the piece of Animalintex in a low tray or on a plate with the plastic side facing up. Do not use a bucket unless it is cleaned very carefully. Use cooled boiled water, it must be cooled to 38 ºC, and pour it around the edge of the Animalintex. DO NOT IMMERSE. When the liquid is absorbed, take the Animalintex out and lightly wring. The Animalintex should be damp not wet through. Place the Animalintex on the area that needs to be treated with the plastic side on the outside, shaping to the body. Cover with a bandage and make sure the Animalintex is completely covered. Follow the same procedure as above, but let the boiled water cool completely before placing the Animalintex in. Dry the dressing. After cleaning the area to be treated, place the Animalintex directly onto the area. If you use Animalintex dry, you can reuse the dry Animalintex for extended effectiveness. Animalintex 40 x 20cm: possible to cut in desired length, available in 1 or 10 dressings. Have you used Animalintex before? Let us know what you think about this product.